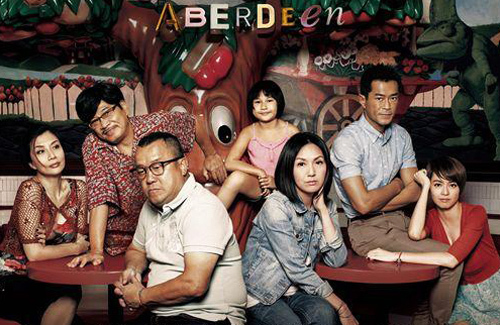 Pang Ho Cheung’s (彭浩翔) latest film Aberdeen <香港仔>, premiered in Hong Kong and China on May 8, 2014 to fantastic critical reviews. Starring Louis Koo (古天樂), Miriam Yeung (楊千嬅), Gigi Leung (梁詠琪), Eric Tsang (曾志偉), and Jacky Choi (蔡潔), Aberdeen sends a message about reconciling with the past in order to greet a better future. Due to his harsh comments, Chapman has received death threats from many angry netizens. There was speculation that due to recent events, Pang Ho Cheung was forced to cut Chapman’s scenes in Aberdeen for the mainland Chinese release. However, Pang Ho Cheung denied doing so, arguing that Chapman’s scenes in the film, though small, were essential to the storyline. Boycott and death threats?? Are they for real? If this is indeed true, then the said Mainland Chinese netizens need to open their eyes and grow up. You want people to not support the Taiwanese students and their protest, give them a good reason not to. Threatening them will only give them more reason to support the Taiwanese cause. And trying to censor people will only make them want to speak out even more. There is not need to generalize the whole population based on the few hot headed troll posters on the internet. There are many instances in which HK, Taiwan and China netizens have posted craziers stuff on the internet. However, Chapman To have the freedom to say what he said and other people have the freedom to boycott this current and his future movies. What do you expect when he challenge the mainland Chinese whether they have guts to stop him from going to China. If same remarks were directed at the Thais the same way I am sure he will be shot if he were to go to Thailand. u should check out the anti-mainlaind hk people protesting mainlaind university student getting killed in a car accident. they used her death to vent their hatred for mainland chinese instead of feeling any sympathy at all. as for the taiwanese student pact, these are the pro independence leftovers of the chen shuibian administration that almost ruined taiwan financially due to their anti china stance. now they are doing the same thing. of course president ma is not stupid enough to let these people have their way. chapman has a history of offending people so no surprise he pissed off a lot of mainland chinese cuz hes also on the anti mainland side in hk. anti china people always flock together to make a stance. hell even pro independence taiwanese invited terrorist uighurs to meet them but was stopped by president ma. And don’t forget the part in which Chapman To mocked the Chinese on Weibo and said they are all “self-righteous and not capable enough”. And the boycott effort is already taking affect on Chapman To’s movie “Let Go For Love” which only took in $71,892 at the box office at its premiere. Unless To is a superstar you can fking bet directors and actors/actresses aren’t going to beg him to work with them again. To me he is a 1st class Moron and I avoid seeing any movies which he is in. wow go for jacky choi!!!!!!!!!!!!!!!! yay!!!!!!!!!!!! I didnt know there was a place called Aberdeen in HK. To me Aberdeen is a place in Scotland so I was quite confused when I heard the name in all the hype about the movie. I love what Pang Ho Cheung said about how making this movie was a collective effort and that as a filmmaker his number one priority is the audience. Shame a lot of hk film makers don’t share this philosophy and only care about chasing the dollar/yuan. Chapman To is an idiot who thinks that bcuz he is a “star”, he can talk nonsense with impunity. If he was in a ghetto talking trash, he would get a serious beatdown or even losing his life as others will teach him to give respect to others the hard way. The trailer seems like a snooze fest to me. All I see is a lot of JJ Abrams lens flare. Interesting that the article states the film premiered with “fantastic critical reviews” but says nothing about box office results. Just curious whether the threat of boycott has taken its toll on this film. I remember glancing over headlines that box office results for “Arberdeen” were lackluster in Mainland China. The box office news came after this article was published. Finally saw the box office results for the first week of showing. Lackluster might not be the appropriate description; I would say it was disastrous. I don’t think it can last another week as Chinese cinemas are very aggressive in turnovers. anyone know this movie’s genre? it doesn’t look like it’s comedy. I saw it last weekend while it was still playing in theatres on Toronto. Indeed uts no comedy, it wasn’t awful either. But it looks like its been removed from the theatres in Toronto already.